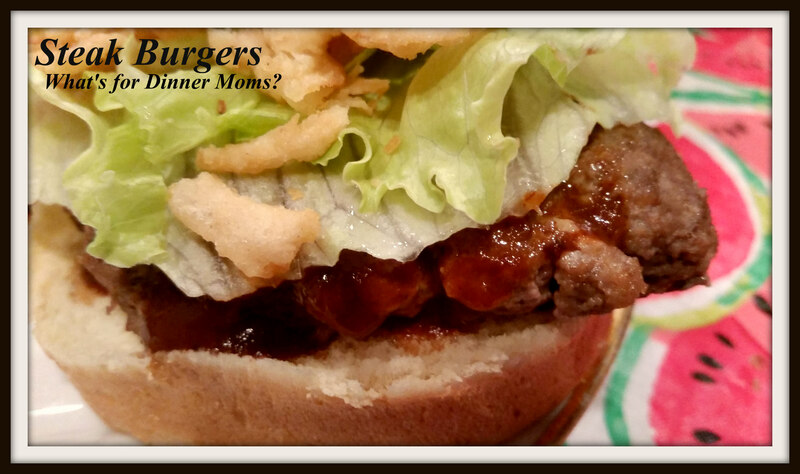 Steak Burgers – What's for Dinner Moms? I try to take my family’s tastes and what they like into account when I make my menus. Yes, I do try to stretch them, and myself, a bit at times with food choices but sometimes comfort food and a simple hamburger or hot dog are all you want. My kids wanted hamburgers and fries the other night. Of course I am not going to just make a hamburger and fries and they know it. When they asked me to just have a burger I tried to keep it simple. I used steak seasoning to try to ramp up the flavor and for the fries I made thick steak fries with seasoning. Unfortunately, I didn’t get a picture of the fries although they were good! This was yummy! It was nice to have a burger and fries for something different. The added steak seasonings with the fried onions and the fresh bakery rolls were delicious! I may just have to make burgers a bit more often rather than just once or twice a year. I served this with homemade steak fries with seasoning and green beans. I may just need to add a milkshake to this meal next time to make it feel like a meal out. In a bowl mix ground beef, Worcestershire sauce, steak seasoning, powdered garlic, onion powder, eggs and bread crumbs until well combined. Portion meat into 8 equal size patties and cook as you like (grill, fry or bake) until just cooked through. Serve on rolls, with steak sauce and fried onions as toppings, if desired. Thanks for the recipe! Definitely will try. I need to buy the Steak Seasoning ! ! Thanks for sharing. It is very peppery. If you don’t like black pepper choose one of the other steak seasonings. They have several to choose from. I like peppery. I’ll take what you have, lol. Oh wow, I don’t know what we’d do without hamburgers at at least a couple of times a month in the summer! There are so many creative ways to doctor them up, too! Steak seasoning is great on burgers!